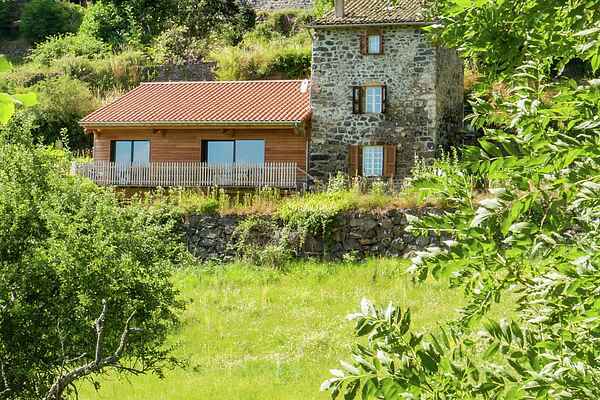 This beautiful stone cottage with fireplace and a cozy decor offers you the relaxed and carefree atmosphere you need to enjoy the holiday you have long been waiting for! The house is detached that offers peace and privacy. It also has a large garden where you can enjoy the beautiful view. The interior of the house has a rustic and cozy character and features original details like an authentic stone fireplace. Sit by the fireplace with a baguette and some French specialties and enjoy a relaxing night. In the area is much beautiful nature to admire. The house is in fact situated in the heart of a natural park. Nearby you will find Le Puy en Velay (24km), which is highly recommended. You can visit a beautiful castle and fortress and take a dip in this way in French history. If you are looking for something more active, you can play tennis in Monistrol d 'Allier (5km) or go cycling on one of the beautiful and nearby bike trails. In addition, you can at the beach Monistrol d' Allier (5km) or at the Lac du Bouchet (22km) perfect unwind.